August Foodie Pen Pal Box! This month’s foodie pen pal box comes from Christina in Florida, who hit a home run with some amazing flax snax, a sugar cookie mix, and maple bliss cookies. This is such a great program–I love getting matched up with new people each month and trying new goodies. The Go Raw brand is new to me, and the Spicy Flax Snax were a delightful surprise–I was a little nervous seeing that they had jalapeno and cilantro in them, but the amount of kick they had was just right. I really enjoyed the unique blend of flavors and the ultra-healthy sprouted seeds. I was already a huge fan of Lucy’s Cinnamon Thins, but I’d never tried Lucy’s Maple Bliss cookies. Yumm-o!!! I ended up eating the whole box myself over the course of 3 days; the hubby didn’t even get to try one. The DW’s sugar cookie mix was a huge hit, although it was a bit of an indulgence with the non-dairy margarine, so I definitely shared with the kids and hubby. I loved my box this month! 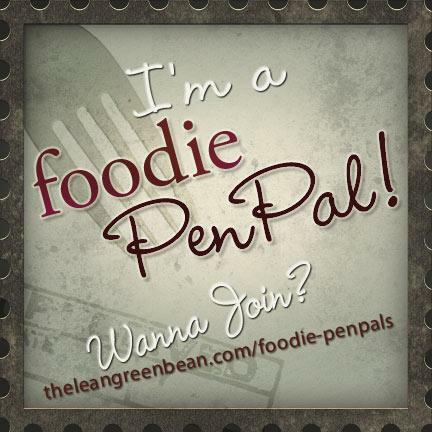 If you think you’d be interested in sending and receiving a Foodie Pen Pal box, check out The Lean Green Bean Foodie Pen Pals. Also, if you want to see what I sent in the box I mailed, check out this post over at Veggie Girl Cooks! 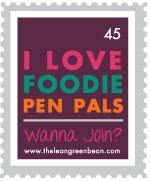 September Foodie Pen Pal Box! July Foodie Pen Pal Box Peanut Butter Chocolate Chip Cookies (Dairy-Free and Egg-Free) Whose Kitchen Is This?? ?